McNeel Europe is pleased to welcome Francesc Salla, product manager of VisualARQ at Asuni CAD, to tutor a 3-day BIM oriented Rhino Workshop for Architects, Engineers and Designers at our Barcelona offices. 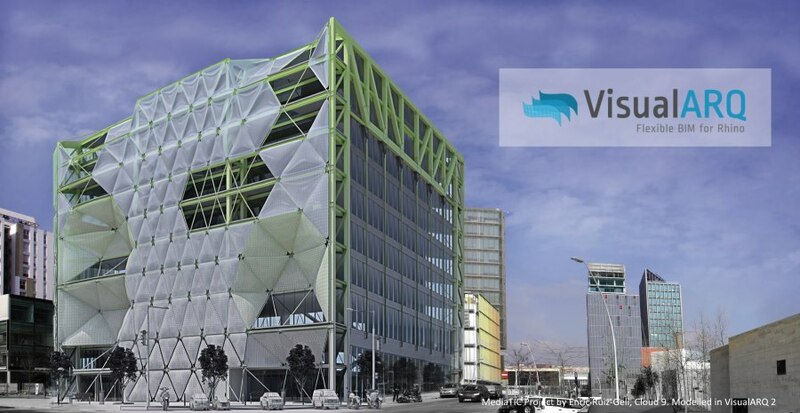 VisualARQ adds flexible BIM features to Rhino. The workshop aims at learning Rhino, VisualARQ and Grasshopper as a Flexible BIM solution for developing and carrying out a project of architecture from the 3D model to the 2D documentation. The workshop will help you to improve your architectural modeling skills and parametric design workflow inside Rhino and Grasshopper. Work with 3D parametric architectural objects. Create new custom parametric objects, also from Grasshopper. Manage the model with Levels and Sections. Customize your workflow with the VisualARQ Grasshopper Components and other Grasshopper add-ons. Add custom data to geometry in the model. Create lists for quantity take-offs. Dimensions, areas, annotations and other 2D drafting tools. Vector output printing, page Layout setup. Import and Export 3D models through IFC. Add custom IFC information to geometry, also from Grasshopper. Team collaboration with external references. Course Fee: EUR 795 (+VAT); full-time students, university teachers (proof of status required) and remote attendees will get a 50% discount. Please note your seat is only confirmed once payment has been cleared. Max. Number of Participants: 10 + 5 remote participants. If there is no quorum, the course will be cancelled 15 days prior to the start date of the workshop.